The Billy Mayerl Society existed to promote the works of Billy Mayerl and others who worked in the same idiom. It issued magazines, promoted concerts and held both informal meetings and soirées at which artistes were invited to perform. Membership was worldwide with pianists especially welcome and there was an excellent grand piano available for them to play. 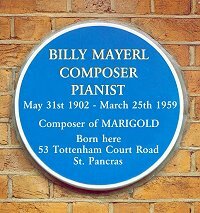 Publications relating to Billy Mayerl are to be found in the Reference Library. Click here to access video clips of some of the artistes performing for the Society.